We can provide a number of different services relating to Daylight and sunlight analysis issues. Sunlight Modelling – analysing how the sun will light the interior of your building during the day – this can be undertaken for existing and proposed buildings. Sunpath and Shadow Modelling - analysing the sun path and the shadows cast by your building to determine areas which may be left in permanent shadow or underlit. Light issues for Planning - we provide the required evidence and reports showing if neighbouring properties are adversely affected by a new development. This may be in relation to issues caused by a proposed development potentially overshadowing and existing or where a new development may not receive sufficient internal light due to the proximity of existing buildings. We advise our clients (from private individuals to developers, architects or local authorities) on the impact that a proposed development may have. Whether a proposal will meet BRE guidelines or possibly have an unacceptable impact, in which case, we can advise on how to alter any scheme to overcome such issues. 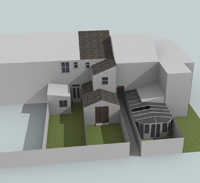 We use 3D modelling software in conjunction with the latest advice and calculations from the Building Research Establishment (BRE), to overcome any problems you may have and achieve a balanced development. © 2011 Cobalt Design Ltd.